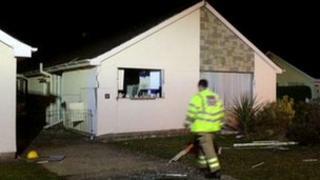 A man has been taken to hospital with superficial burns to his hands and face following an explosion at a bungalow in Gwynedd. Fire crews were called to the incident at Morfa Bychan, near Porthmadog, at around 17:20 GMT after a suspected bottled gas explosion partially demolished the single storey home. The injured man was taken to Ysbyty Gwynedd in Bangor for treatment. The fire service said an investigation into the incident was under way.